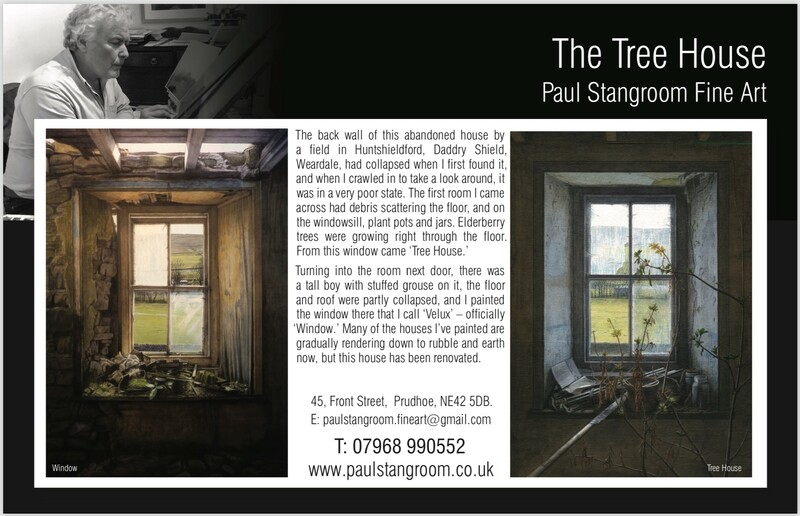 I'm pleased that the story of one of my favourite paintings has been featured in the Tyne Valley Express this month. I found both of these windows in a long-abandoned house in Huntshieldford, Daddry Shield, Weardale. The house was in such a poor state that I had to crawl into it - the back wall had completely collapsed. And yet, once inside, it was a treasure trove of 'found' objects, including a tallboy, stuffed grouse and plant pots. There was an elderberry tree growing right through the floor. I produced both of these paintings based on windows in that house, 'Tree House' and 'Window' - and the hole in the roof in 'Window' makes me think of the painting to myself as 'Velux.' It's a personal favourite.